For a decade “Verslo žinios“(Business news website and daily newspaper) continues with the project of “Gazell“, which is dedicated to small and medium business. Project contains ten events and special newspaper rubric, in which business conditions of different country‘s regions are rewieved. The goal of the project – not only provide information, news that small business is concerned about, but also draw the attention of society, to show new market leaders, as well as to bring together these big potential companies and stimulate them to share their effective business experience. “Verslo žinios“ focus on small and medium companies not only throughout conferences – whole year daily newspaper‘s journalists write articles about sucsessfully and with clarity working companies of the country. 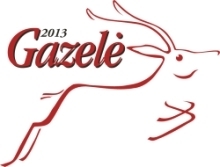 Gazell can become company of any proprietary, whose return during the last four years was growing. First year company‘s circulation was 1-138 mln. Lt and for the last comparative years company was working profitably.